This picture comes from 9 et 10 Thermidor, the splendid illustrated book of 1908 mentioned in my earlier post as being available in the Picpus Digital Archives. It is a part of a waistcoat which belonged to Robespierre! The mottoes read "Vivre libre ou mourir" ("Liberty or death") and "La Nation, la Loi, le Roi" ("Nation, Law, King"). 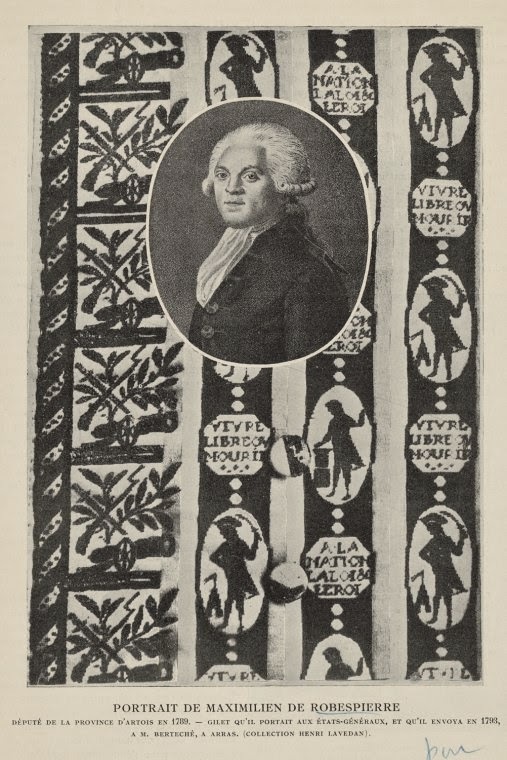 The waistcoat was apparently sent by Robespierre to a certain M. Bérteché, an admirer in Arras in 1793 (when loyalty to the King was presumably no longer good garment graphics). The only evidence for Robespierre actually wearing such an item is Hector Fleischmann's statement that Vivant Denon once met him in the gardens of the Tuileries dressed in an embroidered satin waistcoat of rose silk - which may or may not have been this particular one. However, the style and colour are consistent with Robespierre's reputation for dandyism. The waistcoat is confirmation too, should any be needed, of just how seriously French Revolutionaries took uniforms, costumes and symbolic accoutrements of all sorts. The fragment is documented as part of a collection belonging to the Academician, dramatist and associate of Lenotre, Henri Lavedan. It was reproduced by Hector Fleischmann in his Robespierre et les femmes in 1909 and the New York Public Library has a print that looks roughly the same date. 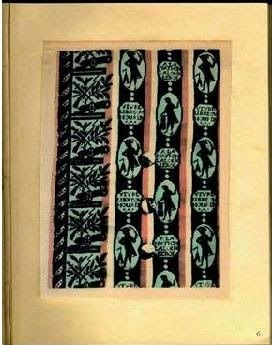 In April 1933 it was bought by the actor Sacha Guitry, who also apparently possessed Robespierre's lace jabot. I can't find any evidence of where it is now, if it still exists; certainly not in any of the big French public collections. 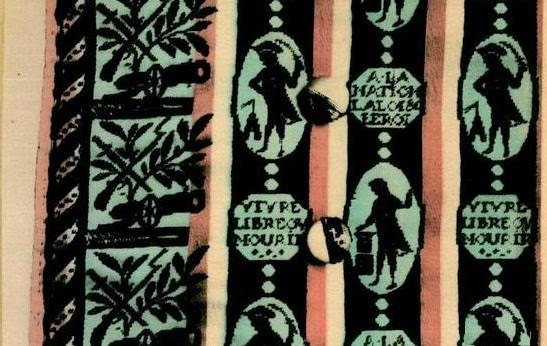 [INDEX 13] Fragment of a waistcoat with stripes of silk and velvet which belonged to Robespierre and was sent by him in 1793 to M Bertéché, in Arras. One of the stripes of the design has the device: VIVRE LIBRE OU MOURIR, alternating with another: LA NATION, LA LOI, LE ROI.